Writing with Hitchcock is proud to announce our first Hitchcock Halloween Contest! Between now and 12:00 AM Eastern, Tuesday, November 2, 2010, submit your photo to the Hitchcock Halloween Contest by posting it on the Writing with Hitchcock Facebook Wall. At 12:00 PM Eastern, Tuesday, November 2, 2010, all submissions will be placed in an Album and judging will begin in the form of a poll on the page. The poll will be open until 12:00 PM, Sunday, November 7, 2010 when the winners will be announced. For more info on The 39 Steps visit www.39Stepsny.com. For tickets visit Telecharge.com. 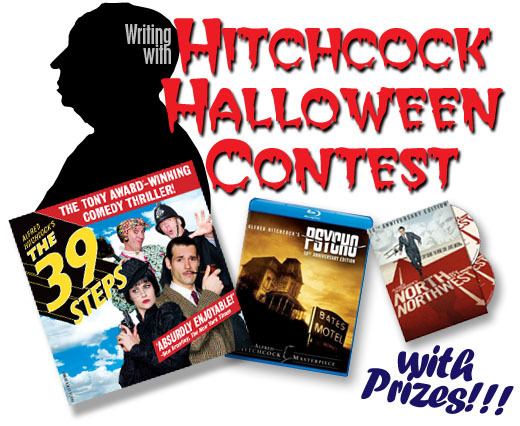 CONTEST RULES: You must be a member of the Writing with Hitchcock page to submit a photo. It must be you in the photo. You may only vote in the poll one time. You must be a member of the Writing with Hitchcock page to vote. Yes, you can encourage all your friends to join the page and vote for you! CONTEST RESTRICTIONS: First Prize is valid for two orchestra seats to The 39 Steps at New World Stages in New York City on a select performance through December 30, 2010. Winner will have the option to choose from a variety of dates. Blackout dates apply. Second and Third Prizes are Region 1, US Release only.